Pulau Sempu is a small island in southern coast of East Java province that located at Tambakrejo village, Sumbermanjing Wetan subdistrict of Malang regency. This "pulau" or Island is grown tropic plants with 877 hectars wide and has tobe as the nature resource of East Java conservation since 1928. 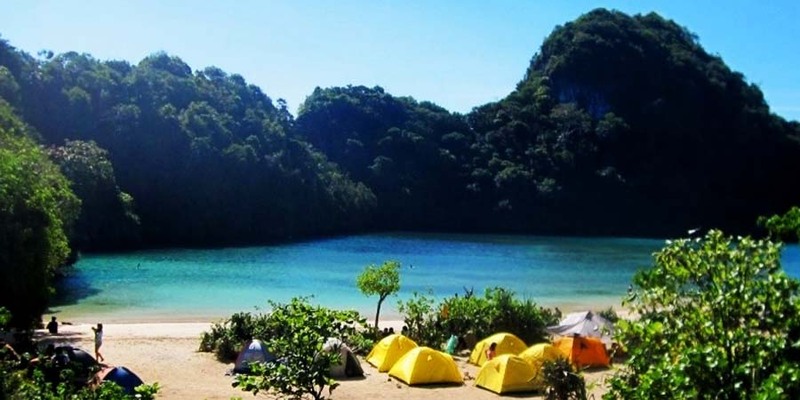 Pulau Sempu is very possible to be a camping place, swimming and fishing, because it has fresh and cool water in mountain area and also surrounded by huge green slope while waiting for the surf coming through the slope hole that very awesome to enjoy the view. Pulau Sempu is always heavy of domestic and foreign visitors because it has spectacular view that form a small natural lake in middle of it's island and formed by great surf that flows from the southern coast through the hole in one of the island border side and circled by green and steep slope. This island has clean, smooth and white sand. Pulau Sempu located in the fish auction, Sendang Biru of Malang subdistrict. The nearest way to enjoy Sempu Island tour package is from Malang city with the distance 67 kilometers or 2,5 hours from Malang city and 4 hours from Surabaya airport by car. Most visitors usually combine the Pulau Sempu Island vacation between Surabaya and Malang City tour. Pulau Sempu, Bromo Tour Package 3 Days is better visited on April - September month because the Sempu Island itself located around Malang shore in order You can get a nice views. This trip itinerary categorized in Mount Bromo tour 3 days 2 night, For detail itinerary, You can read more below. Wake you up at 05:00 AM to have breakfast and enjoy Pulau Sempu view until satisfied and continue to Telaga Lele through the small path in tropic forest by walking, after get Telaga Lele enjoy the view until finish and continue to Telaga Asat for 2 hours by walking, after get Telaga Asat, enjoy a wide beautifull hill in Telaga Asat and continue to Pantai Kembar for 20 minutes by walking then continue enjoy the beach until finish and cotinue to Segara Anakan unti finish enjoying by local guide accompaning. After finish enjoy all views, comeback to the jeep then continue to your hotel to have breakfast, take shower and preparing to check out. Free program and finish Sempu Island and Mount Bromo tour package 3 Days.